If you have fished for trout before, you probably know that they love lying near fallen logs, shrubs, and trees. While this makes for an excellent hiding place for the trout and produces an excellent food source, it becomes the angler's worst nightmare - snags. A trout can hide quite well underneath these obstructions and simply watch prey float by until it finds one that looks good but again, this means casting into some very difficult areas that without a doubt will cause a snag. 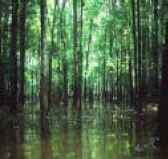 You will find some areas created by a small log that has been dragged downstream or large logs that have become embedded into the bottom of the lake, river, or stream. You will also find older trees that have broken off and fallen across the water while resting partially in and partially out of the water. For this type of obstruction, the trout love the ability to have some shade but also because of the way the water flows, they can position and reposition their bodies as needed to catch pretty. Fallen trees are excellent places for food to become trapped as well. The trout can choose to lie underneath, in front of, or just behind the tree and begin to scour for food. Another obstruction that is advantageous to trout is tree roots, especially those that have some exposure to the surface and are lying close to the bank. 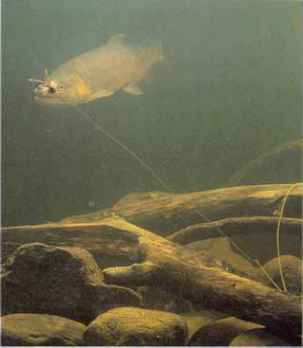 Many times, these roots will create caverns that are ideal for fish to lie in but difficult for the angler to fish. When it comes to weeds and reeds, trout love lying in front of, to the side, or behind them. If you have the patients and do not mind working out some snags, this is an excellent place to find trout feeding.